That tutorial introduced an EmptyRouterView component for handling the nested routes. By handling the visibility of dialogs with vue router we can easily toggle them by navigating to the corresponding urls. And in my opinion this results in a more clean codebase. So how do we do it? The component now contains two router-views. The lower one (the default one) is used for displaying the background (or the normal page in case no dialog should be shown). Meanwhile the one for the dialog will contain the content of our dialog. This is a pretty simple component, however you need some styling to make it look like a dialog (you could also use bootstraps classes for it, or something else). Maybe you noticed that I also included a back button already. We can simply use the router.back() method for navigating one page back to close the modal, since we toggle the visibility with the routes from Vue-Router. 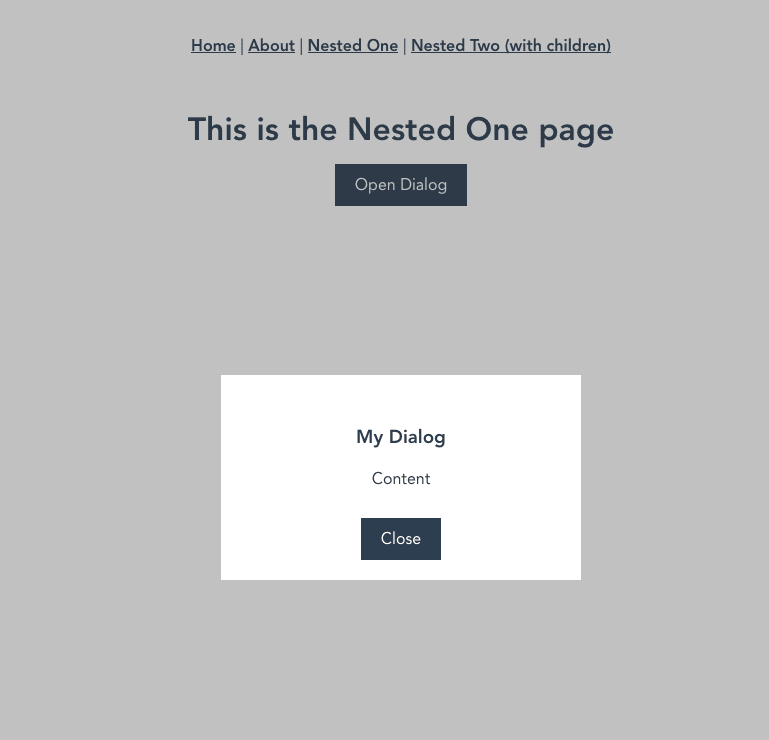 For our dialog route with name nested.dialog at the url /nested/dialog we specify the components MyPageView as the background and MyDialogComponent for the dialog itself. Since this route is a child of a route that has the EmptyRouterView component, these components directly fill the router-views specified in our EmptyRouterView Component.